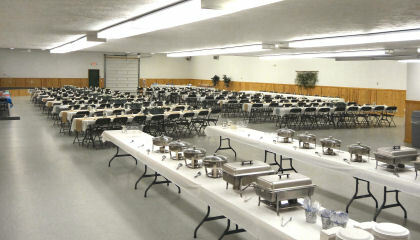 Available year-round for your family, group, orgainzation or buisness event. Plenty of parking and camping close to the hall. May not be available durning some regularly scheduled fairgrounds events. Small stage with P.A. system. The community building is located at the main entrance to the fairgrounds. other fairgrounds buildings are also accesable for smaller groups. Full kitchen facilities with stove, oven, cooler, microwave and sinks.